Thank you for choosing Harper&Bright Designs to help complete your home. Gift the child in your life a bed that will turn their room into an interactive playground with the Harper&Bright Designs Barney Loft Bed. Crafted with your little one in mind, our Barney Loft Bed is resistant to common wear and tear, constructed with solid high grade wood that has been smoothed and lacquered to perfection in the shades ivory white, deep espresso or classic chestnut. 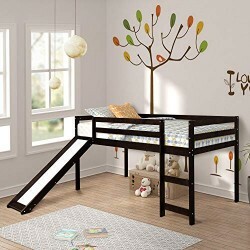 With its dual-purpose design, your child will enjoy navigating up their loft with the easy-climb 2 rung ladder and interactive slide, along with exploring the spacious underside of the bed that can be used as a fort play area or extra storage for toys. Guardrails line the perimeter of the bed to keep your child from falling off. Designed with a simple yet fun design that both you and your child would love, upgrade your child’s bedroom with the Barney Loft Bed by Harper&Bright Designs today. *Manual measurement has been used, there may be room for reasonable error. *Items may slightly differ from the photo in terms of color due to the lighting during photo shooting or your monitor’s display.